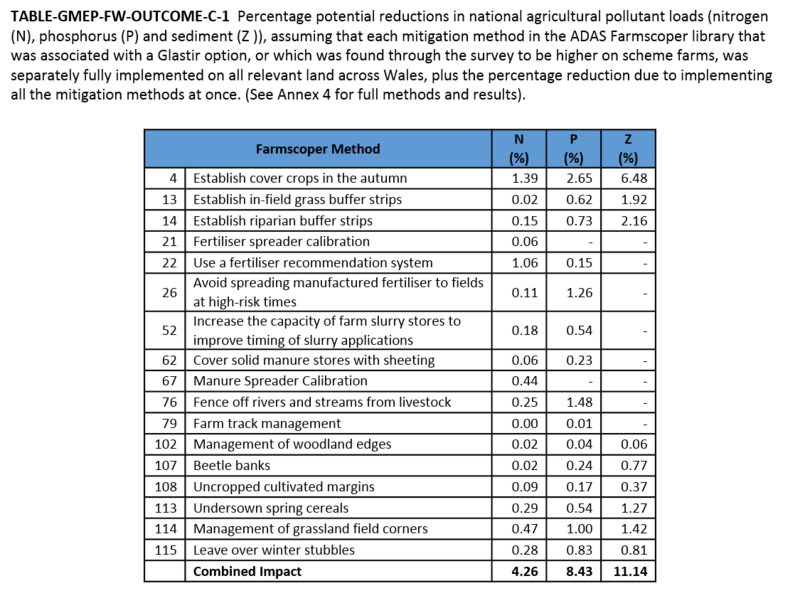 The modelled projected net impacts of Glastir on pollutant losses from all agricultural land (i.e. including land not in Glastir) by the Farmscoper model are small at around 1%. These reductions are significantly lower than projected in Year 1 from all agricultural land in Wales in which scenarios of uptake were used rather than actual uptake. Reductions in pollutant losses are approximately double (i.e. 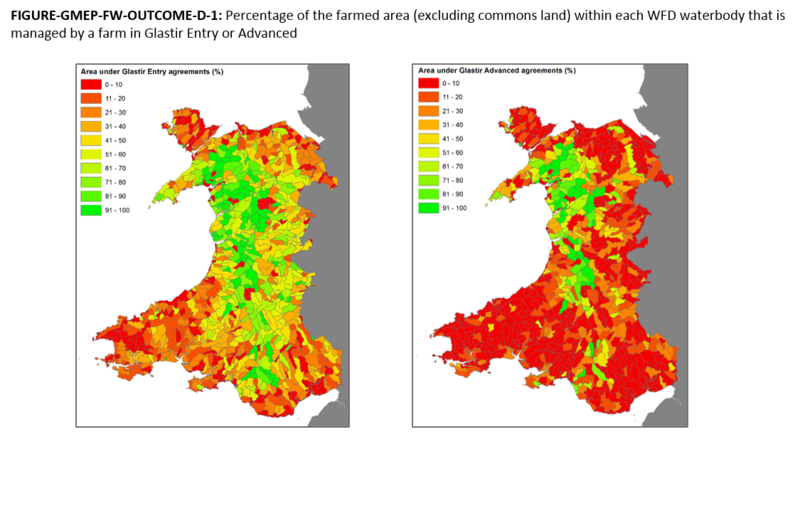 2%) on the land managed by farms in Glastir, with greater reductions possible at more localised scales. 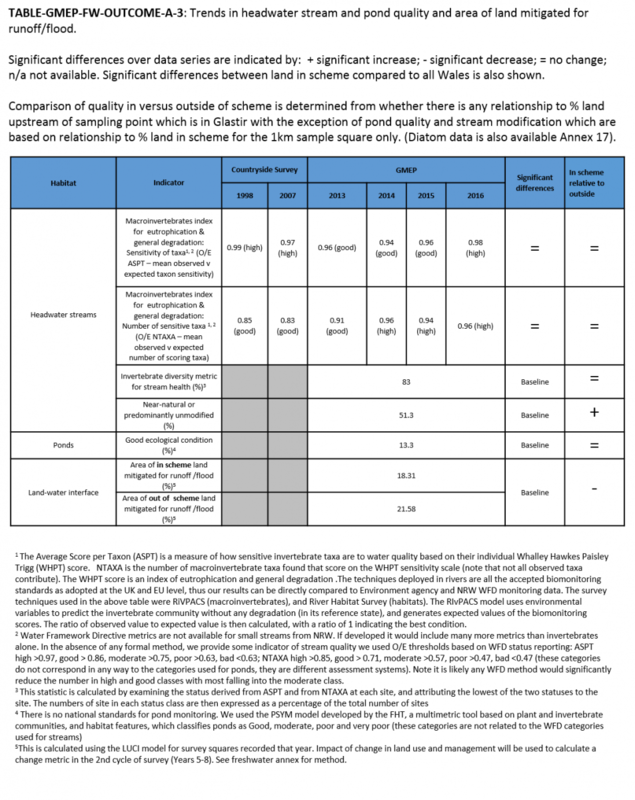 The effect of the Glastir scheme is limited by both the number of participants in scheme and the amount of land under prescription within individual land holdings. Glastir agreements do not correlate with areas where leached and runoff losses of nutrient from the soil, particularly nitrate, are most intensive (e.g. Pembrokeshire, Anglesey). The overall combined impact of all of these methods being raised to 100% implementation are reductions in national agricultural loads of 4% for nitrate, 8% for phosphorus and 11% for sediment. The scheme could potentially have a significant local effect if options were more intensely focussed. The LUCI models projects an increase of 3% (11,641 ha) of land mitigated for flood risk and nitrogen and phosphorus delivery to rivers due to land use changes included in Glastir contracts. Mitigated land is the area upslope of a mitigating feature which reduces the direct connectivity between land and water thusreducing nutrient runoff. The increase has been delivered by the creation of just 4,120 ha of mitigating land representing a three-fold benefit of 'land altered' to 'land benefit'. Both the Farmscoper and LUCI models used in this assessment agree the reductions of nutrient diffuse pollution are likely to be modest i.e. 1-3%, thus increasing our confidence in the modelling result. Over the last 20 years new analysis of small stream data from Natural Resources Wales show an ongoing improvement in invertebrate diversity and nutrient status. 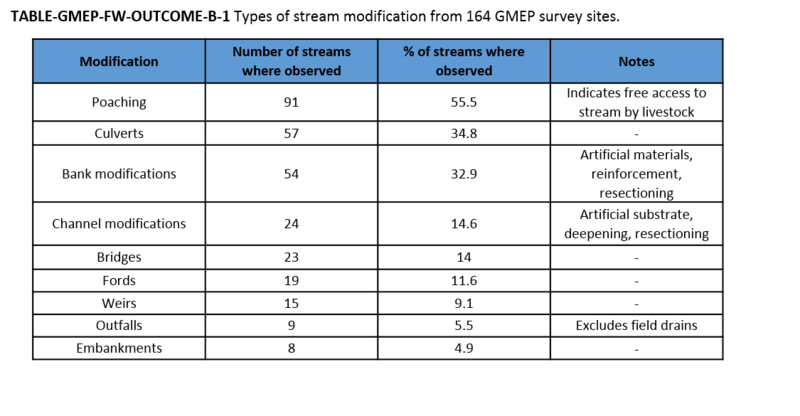 GMEP sampling of headwater streams indicates more than 80% have high diversity according to invertebrate indicators. There are an estimated 9.5 to 16 thousand kilometres of headwater streams in Wales and they are a priority conservation habitat for a range of characteristic plant and animal species, so this result is encouraging. There has been general improvement in Welsh farm practices between 2009 and 2016 related to improving water quality through more efficient use of resources and control of diffuse water pollution. Methods were relatively simple to implement and involved a low capital cost, such as calibration of fertiliser spreaders, particularly for manure management on cattle & sheep farms. These management actions have been encouraged through government and agricultural sector advice and guidance, most notably the Code of Good Agricultural Practice, Cross Compliance, Tried and Tested, and Farming Connect. 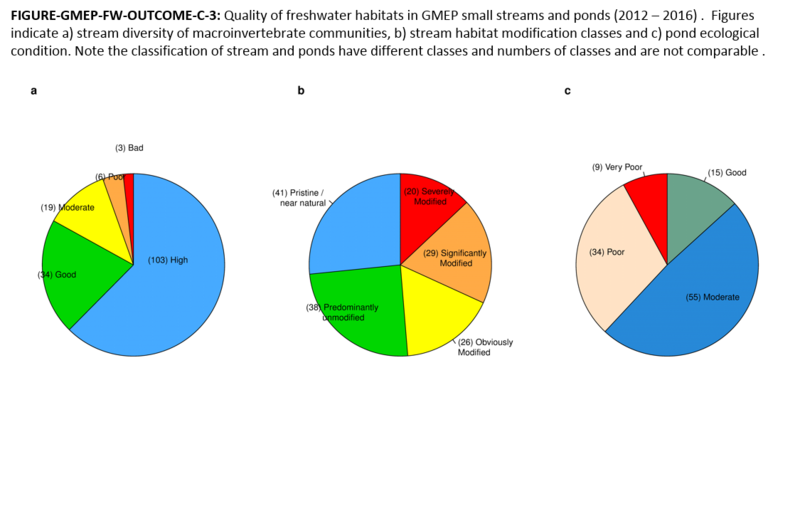 Only 13% of ponds sampled were judged to be in good ecological condition. Ponds are important to the Welsh landscape because they provide characteristic habitat and biota. They act as stepping stones for biota to disperse over wide distances while also providing refuges for wildlife, and are also priority habitats under the EU habitats directive. There is a substantial amount of pond habitat in Wales, around 57,800 ponds in total. Further analysis is needed to identify the cause of this poor condition which could include poor creation practice, lag time after pond creation, runoff from adjacent fields etc. 55% of small streams were found to be freely accessible to livestock. This increases the risk of damage to banks and associated raised sediment levels and increases the risk of phosphorus and pathogen levels. The latter has implications for contamination of shellfish beds, human health and recreation. It should be noted that some access to stock is essential for exposed.